(Francisco Kjolseth | The Salt Lake Tribune) A 4-year-old female mountain lion slowly shakes off the effects of a sedative after researchers from Utah State University and the Utah Division of Wildlife Resources replaced her radio collar after capturing her in the Oquirrh Mountains. Over the objections of wildlife advocates and some hunters, Utah wildlife officials are upping the state’s cougar harvest for at least the third straight year. Citing a healthy and stable mountain lion population, the Wildlife Board has increased cougar permits from 581 to 642 for the 2018-19 season, which runs Nov. 7 to May 31. The decision has drawn a rebuke from those opposed to trophy hunting, who argue the quota represents a quarter of the state’s adult cougar population and should be reduced. “Where is your conscience when you make wildlife decisions knowingly based on inadequate, outdated and grossly erroneous information and formulate these wildlife decisions to conform to the wishes of the usual cadre of special interest groups?” Park City physician John Ziegler told the board at its Aug. 30 meeting. He and others slammed trophy hunting as an unnecessary assault on the state’s wildlife heritage. Ranchers and big-game hunters, however, have an opposite view, arguing cougars need to be “managed” to protect mule deer and sheep herds. These losses come despite increased killing of cougars and coyotes in recent years. Yet there is no science concluding cougars have an impact on mule deer populations, according to Kirk Robinson of the Western Wildlife Conservancy. Interestingly, cougar hunters, known as houndsmen because of their reliance on dogs, opposed the increases and persuaded the board to issue 11 fewer tags than recommended by DWR biologists. Longtime houndsman Kenneth Duncan was dismayed that DWR proposed boosting the cougar harvest in the East Canyon unit from 10 to 15. The Utah Houndsmen Association also got the board to consider requiring hunters to record their kills with geocoded cellphone photographs. That way, DWR can confirm the lion’s age and gender, along with the location and date of the kill, all useful data for future management. 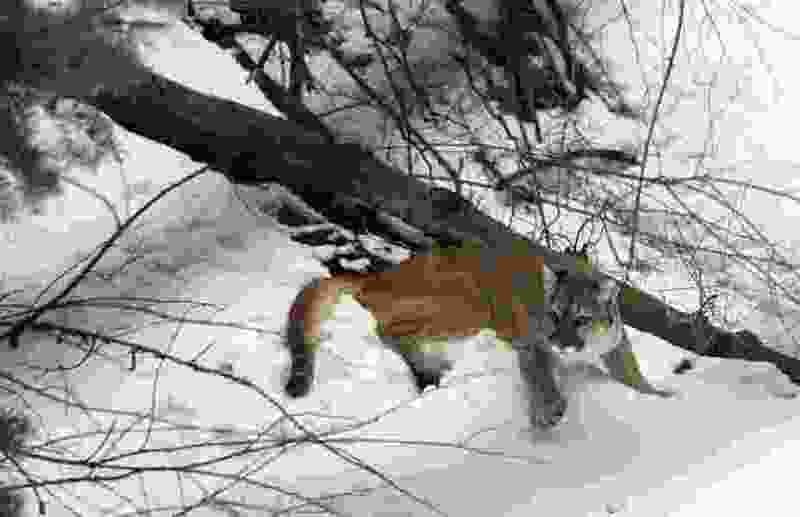 Agency biologists believe the cougar population can withstand heightened hunting pressure because recent years’ harvests fell within management thresholds for the number of female and older cats taken. Last year, 32 percent of the 456 cats killed by hunters were females, well below the 40 percent limit set by DWR’s cougar-management plan. The plan also requires at least 15 percent of the cougars harvested to be 5 years or older. In recent years, between 15 percent and 20 percent of the killed cougars fell into this age category. Since 2004, the state’s adult lion population has more than doubled to 2,500, tracking with mule deer numbers, according to DWR estimates. However, cougar numbers fell last year after deer numbers registered a decline. Confirmed sheep kills totaled 416 last year, costing the state $91,000. However, woolgrowers complain cougars take far more sheep than what they are getting compensated for. Robinson, from the Western Wildlife Conservancy, contends trophy hunting could be exacerbating this problem by removing older dominant toms.